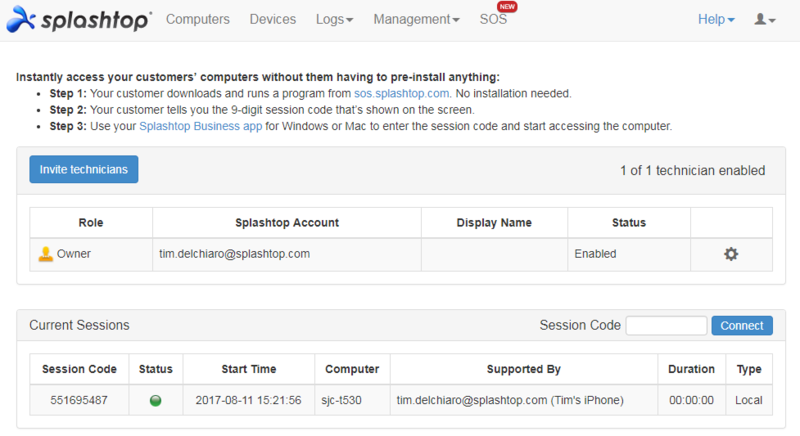 Getting Started with Splashtop SOS (On-Demand Support) - Splashtop Inc. Welcome to Splashtop On-Demand Support. Let’s get you set up. 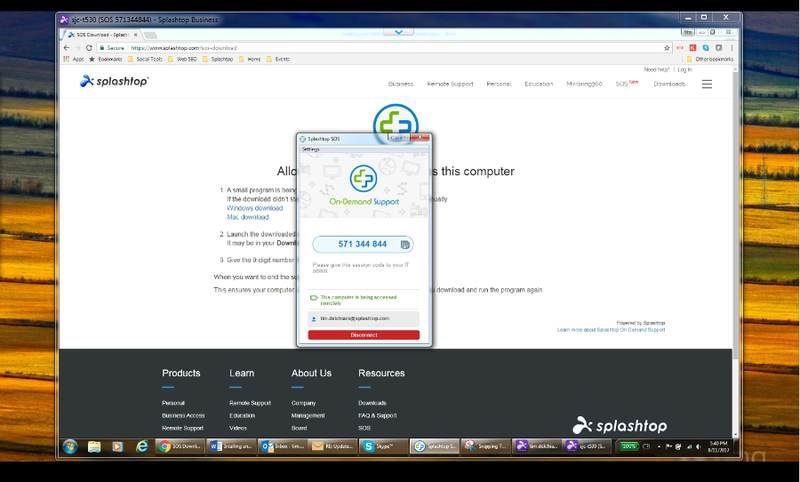 With Splashtop On-Demand Support, you can use your computer or mobile device to remote access and control remote computers and Android devices. With SOS, you can run remote access sessions from your computer (Windows or Mac) or from a mobile device or tablet (iOS or Android). When you start the Splashtop Business app, be sure to log in with the email address and password that you used when setting up your SOS account. 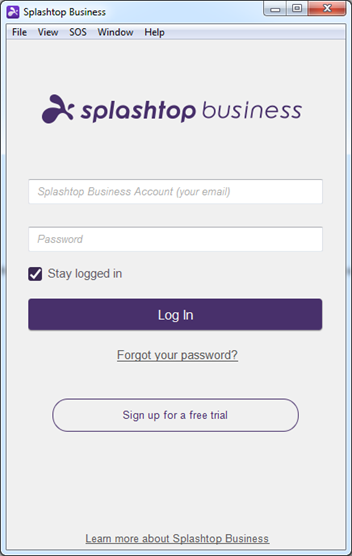 Run the Splashtop Business app that you installed above (on your Windows, Mac computer or iOS or Android device). Ask your user to go to sos.splashtop.com to download and run a small program or app and give you the 9 digit code. Note that the page will automatically detect their operating system and offer them the Windows or Mac download if they are on a computer or a mobile app download if they are on a mobile device or tablet. The user goes to sos.splashtop.com and downloads and runs the app. The user only has to run the app, there is no install process. A 9 digit code is displayed. They give you the code and you enter it in your Splashtop App (after clicking the SOS + icon) and that starts the session. There are some additional options under the Settings menu. Security – Choice of whether to request permission from the user when someone tries to connect. Options are to Reject after the request expires, Allow after the request expires, or Off. If the user visits sos.splashtop.com from an Android device, they are prompted to download the SOS Android app from the Google Play store. They may also be prompted to download an add-on based on their phone manufacturer to add remote control of that type of phone or tablet. After they install and run the app, the experience is the same. They give you the code displayed in the app and you use that code in your Splashtop app to remotely access and control their Android device. When you start a session to access a Windows computer, there is a checkbox where you have the option to “Connect as Admin”. You will be prompted to log in with an administrator account on the Windows machine and you will then be able to perform activities that require administrator privileges. 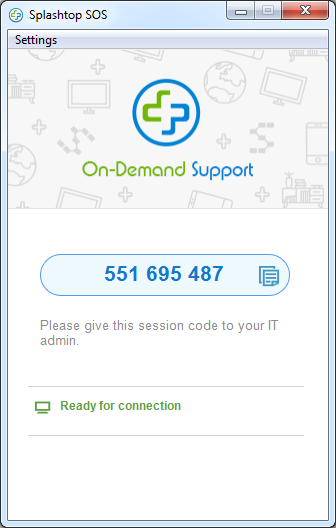 After entering the 9 digit code into the SOS screen of your Splashtop app, click the arrow to connect and the remote access session will begin. Below is the remote user’s computer screen shown in an SOS window on the technician’s computer screen. When you begin the session, the remote computer screen will open in a window on your computer. Within that window, you can control their computer with your mouse and keyboard just like you were sitting in front of it. A drop-down menu (the blue down arrow V at the top of the screen) gives you access to additional control options. When you are done, you can close the window to end the session or the remote user can click the Disconnect button on the access app to end the session. Starting the session from a mobile device is very similar to starting from a computer. Tap to run the Splashtop Business app on your device (in this case an iPad). Look for the “+” SOS icon when you start the app and tap it. You will see a screen that looks like this where you enter the user’s 9-digit code. On mobile devices, the experience of controlling the remote computer is a little different than when working on a computer because you won’t have a mouse. 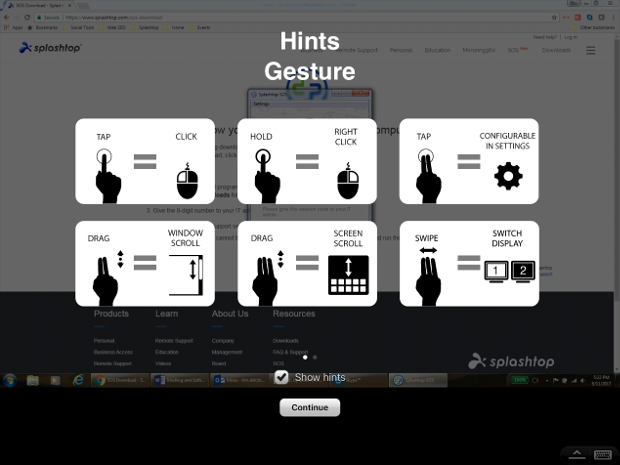 On the initial screen (note the remote PC screen in the background), you will see an overlay that explains some of the finger gestures you can use to navigate the computer screen in place of using a mouse. Click Continue to hide the hints and view the remote computer screen. In the lower right corner of your screen are controls to open the toolbar and access the on-screen keyboard. If you click to open the toolbar, there will be a number of options available to you. And the down arrow button on the right hides the toolbar. When you’re done with the session, just click the End session button at the left of the footer toolbar. And that’s it. Your remote access session is complete! Go to https://my.splashtop.com/sos to manage your account. In the upper right you can access your account information and subscriptions. Use the “Invite Technicians” button to invite additional technicians to your account. Remember that each SOS license allows 1 technician at time to use SOS. If you have five licenses then any five people from your list of technicians can use SOS concurrently. The “Current Sessions” list shows you currently running sessions under your account. 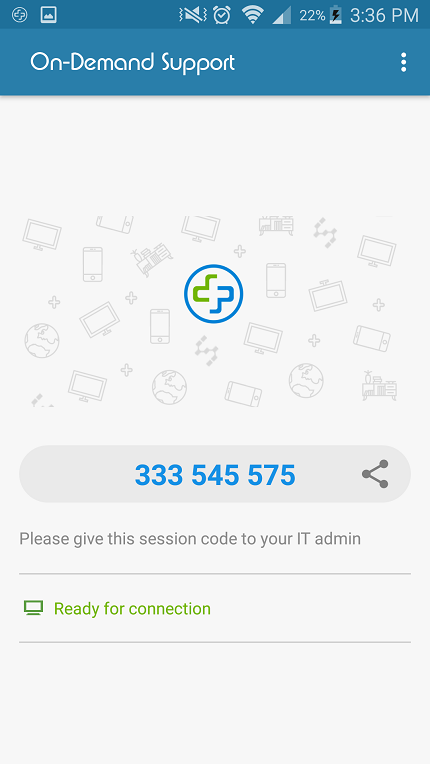 The “Session Code” field and Connect button allow you to enter in the 9 digit code from the user’s computer or device that you want to access. 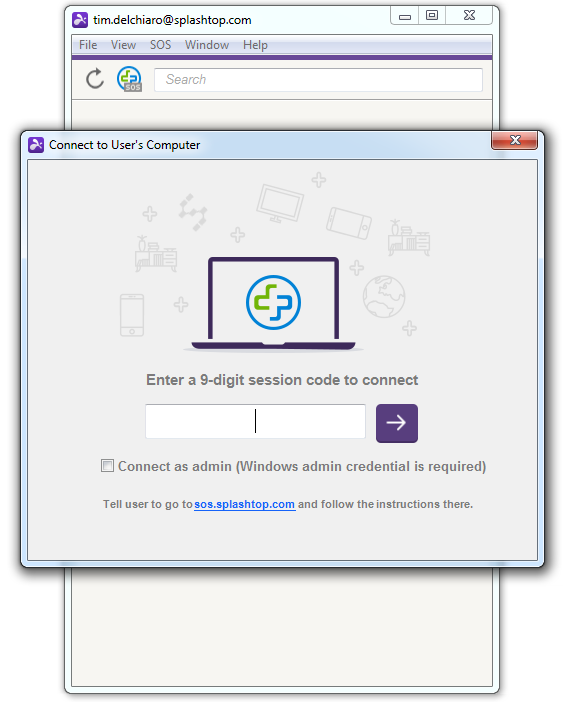 Clicking the Connect button will open the native Splashtop app on your computer or mobile device with the session code loaded and you can start the session from the app. Running remote support sessions from a web browser isn’t supported. 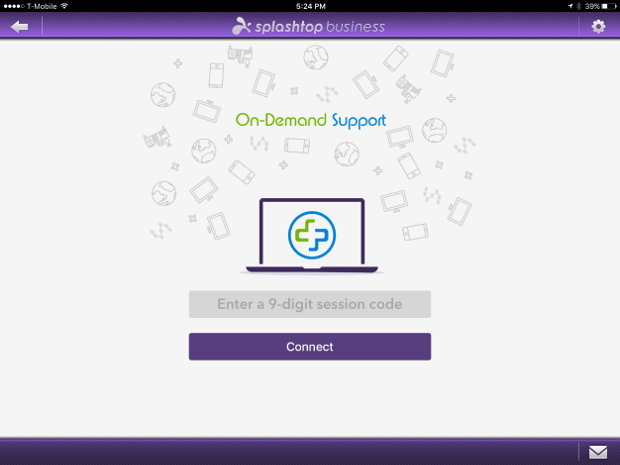 In this article, we’ve seen how to get set up with Splashtop On-Demand Support (SOS). If you don’t have Splashtop On-Demand Support yet, give it a try!